Tonight I'll be teaching at the DKC's Skills Exchange Mini-Workshops. As the website says: "We continue our tradition of having short skill-building sessions as our February meeting. You have the opportunity to learn two or three new skills in short (under 15 minutes) sessions taught by guild members. Learn a skill, move on to the next table, learn another!" I'll be teaching centre out cast on techniques which was prompted by a question asked by a member of my Thursday night knitting group and by my Pinwheel Cardigan Pattern which is worked centre out. There are a number of projects that require a centre out start; top down hats, toe up socks, doilies, tablecloths, and counterpane segments to name a few. There are many ways of performing a centre out cast on. Three methods will be covered in these notes. I recommend using a “sticky” needle; birch, bamboo or any other wood needle that is not highly polished. Slippery needles will be much more difficult to work with as they have a tendency to slip out of the stitches. The rate of your increases above the cast on will determine if you are creating a flat circle like a tablecloth or a more tube like shape similar to the toe of a sock. This method can be used for the tops of hats, tablecloths or doilies. Start with a loose slip knot on a crochet hook and chain 8 additional loops. Put the hook through the slip knot loop and pull the yarn through it and the final chain stitch, to join the chain into a circle. Put the first needle of a 5 needle set of DPN's into that loop. Next, pick up and knit 7 more stitches one into each chain stitch (2 on each of the fours DPN's). The next round will be the increase round of your pattern. You can use any increase method that you prefer. I like YO's or e wraps for the first increase row since it tends to be too tight for some other methods, however the one you choose should be compatible with your pattern. Use a movable marker to indicate the start of your rounds. Hold two of the needles in the palm of your left hand, parallel to one another, with a little space between them. 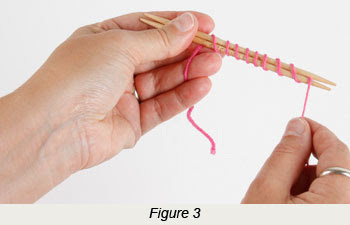 Start with the tail end of the yarn between the needles, to the far left of both needles, so that the working end is at the top. Begin wrapping the working yarn around both needles; from the top down over the front, then up behind the needles, and so on. Repeat until you have 8 loops over the fronts of the needle.End with the working yarn over the front of the needles so it is at the bottom. Bring the working yarn up behind the lower needle and into the space between both needles. Slip the 8 loops close together, and even up the tension. 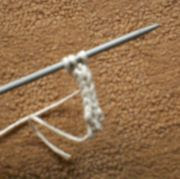 Using the third DPN, knit the first loop on the top needle using the working yarn. Pull the stitch off of the top needle leaving the bottom half of the loop on the bottom needle. Knit across all 8 loops on the top needle in this way. Turn the knitting so that the bottom needle is now the top and vice versa. Slip the stitches to the other ends of the needles. Slip the top needle back so the tip is about an inch back from the bottom tip. Twisting the working yarn around the tail (on the back/wrong side of the work). Hold the tail to the right, and the working yarn to the left, and then bring the working yarn up around the back so it is in place for knitting. Next, knit across the loops on the (new) top needle. Is the pattern used for the green sweater the same one used for the gray sweater on patternfish? Other than the pinwheel design on the back, they look very different. The two sweaters are the same pattern but use different gauge yarns. The pattern includes enough detail that you could use any yarn of any gauge. The green one has a different sleeve hem in that it does not have the band of garter stitch at the hem. The lace weight yarn doesn't roll in the way most yarns do at stocking stich edges.